How to Use Derma Roller Properly & Improve Result by 500%!! Does Derma Roller Really Work for Acne Scars & Stretch Marks? Is Derma Roller Safe for Home Use? What is the Best Dermaroller and How to Pick one? WARNING: Skin needling Can Make Your Skin Condition Worst! It is vital to understand how to use dermaroller correctly. Without proper instructions, derma rolling can damage your skin and trigger an infection. Follow the simple derma roller instructions provided here, and you will transform your skin in less than 8 weeks. If you want to experience the following benefits, then you must read this article! There are many sellers of poor quality skin rollers. Cheap rollers produce subpar results. It is important to own a high quality dermaroller before learning how to use dermaroller. How to Pick the Best Derma Roller? The best dermaroller will produce amazing results and minimize side effects. It will produce less painful treatment. View the article below for more information. How do you choose the best roller? Don’t buy another cheap roller until you read this first. Below is a list of easy-to-follow instructions on how to use dermaroller with guaranteed results. Please read them thoroughly before starting your collagen induction therapy session (skin needling). Derma-rolling is a procedure that produces 1000s of micro punctures (also known as micro channels, micro traumas or micro-injuries) on your skin. This simulates your skin to produce a great deal of collagen and elastin in order to heal the treatment area. As a result, the extra collagen produced can fill in fine lines, wrinkles and acne scars. Rolling can also increase the efficacy of your topical product by boosting its absorption rate into the skin. The procedure is usually done with a derma-roller, but you can also use a derma-stamp or a dermapen. It is simply a plastic roller with hundreds of tiny needles or sharp protrusions. It has various sizes. They are 0.25mm, 0.5mm, 0.75mm, 1.0mm, 1.5mm and 2.0mm. 0.25mm is strictly for boosting topical product absorption, thus increasing the concentration of active ingredients of your topcial product in your skin. 0.25 cannot stimulate collagen production. Only 0.5 and up can do so. Generally, you should stay with 0.25 to 0.5 before jumping to larger rollers. Supplements to Improve Result Should I Use My Derma Roller Daily ? Can I use 0.25 between treatments of 0.5, 0.75 or 1.0? How to Handle 540 Titanium Roller Without Breaking it? 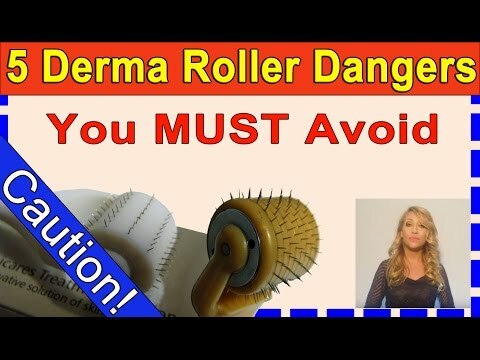 It is vital to handle your derma roller correctly, or you risk breaking it. The 540 interchangeable roller kit comes with 4 detachable roller heads. It is important to cover them with the clear covers. The descriptions are shown below. You should always put on the clear protective cover whenever you are changing the roller head. This will prevent you from bending the needles if you drop the roller head. This will also prohibit you from cutting youself with the sharp needles. How to Remove Clear Safety Cover? Your dermaroller is protected by a clear safety cover. You must remove the cover correctly. Please follow the simple instructions below. Important Note: Pulling the cover off forcibly can break the needles. Take your time! Step 1) Locate the word “PUSH” on top & bottom of the clear safety cover. Step 2) Attach the roller head to the handle in order to prevent dropping of your attachment. Step 3) Press down the top & bottom on the cover with your thumb and index fingers. Step 4) Gently pull out the clear plastic cover. Important Note: To avoid cutting your fingers, pull out the cover with CAUTION. How to Change Roller Heads? Your 540 interchangeable dermaroller kit comes with 4 detachable roller heads. You can switch between different roller heads with different needle length (0.5mm, 0.75mm & 1.0mm). Follow the instructions below to change your roller heads properly. Step 1) Titanium needles are ultra sharp. To prevent damaging the roller and harming yourself, leave the plastic cover on. Step 2) Press down on the left & right side of the plastic cover with your thumb and index finger, . Step 3) Gently PULL OUT the roller head with your index finger and thumb. Step 4) Gently PUSH the desirable roller head into the handle. I highly suggest you to watch Part I and Part II videos below. These videos will help you minimize side effects tremendously. DO NOT use your skin roller if you are currently having acne breakouts. DO NOT use the roller on your lips, eyes, sores and open wounds. For Beginner, AVOID using needle size ABOVE 1.0 mm on your face. It can cause side effects. Needle length BELOW 0.5 mm is not effective for wrinkles, scars and stretch marks. The size of your roller will determine how much you bleed and how painful is your treatment. If you are using 0.25mm roller, you will experience no bleeding, and it is painless. You choose your roller according to the severity of your skin condition. 0.25 to 0.3mm cannot stimulate collagen production. It is strictly designed for daily usage of boosting topical product absorption. 0.5 to 1.0mm is for moderate to deep scarring, wrinkles, etc. If you are unsure which roller to choose, using 0.5mm can get you similar results except with more treatments. Few people have mistaken that the more you bleed the better the result, but that is untrue! You won’t bleed at all using 0.25 to 0.3mm. For 0.5 to 1.0mm, you will experience minimal to mild bleeding unless you roll your skin EXCESSIVELY. Also, you rarely see blood when treating certain parts of your body with higher fat deposit. If you are performing body treatment, you probably won’t experience any bleeding except a few red marks! It is 100% normal. Too much rolling can cause longer recovery time, prolonged redness, swelling and even temporary needle marks. Therefore, you should never force your skin to bleed via excessive rolling and base your result on the amount of bleeding you experienced. Please refer to the chart below for other needle sizes. How to Use Dermaroller Properly at Home? If you are planning to use 1.5 or 2.0 mm roller, please avoid using it on your face unless you have professional instructions and a qualified physician. Incorrect usage of 1.5 or 2.0mm roller can lead to collagen breakdown. Also, you might need numbing cream for your treatment that is painful and bloody. Step 0) You MUST make sure that your roller is not defective before usage. If your roller is defective, DO NOT USE IT! First, a normal roller should roll freely, and it should not get stuck while rolling. Otherwise, it is defective. Second, You should examine your roller closely. A normal roller should not have irregular or bent protrusions. Otherwise, it is defective. Step 1) Pick and attach the desirable rolller head. Step 2) In order to prevent infection, you MUST disinfect or sterilize the roller head for 20 to 30 minutes BEFORE & AFTER the micro needling procedure. Isopropyl alcohol is recommended. You can also use denture tablet. Important Note: When disinfecting your roller in a container, lower it gently or slowly into the container. Do not drop your roller into the container. Dropping your roller can damage it. Cleaning yor face roller correctly is extremely important. A dirty roller can trigger a breakout or even an infection. I have noticed people using spray bottles that were filled with water or alcohol to clean their rollers. This will not clean your roller properly. Please do not do that! Boiling hot water can kill bacteria and germs, but you shouldn’t use it to disinfect your roller. Boiling water can melt and damage your roller because it is made mostly of plastic. Step 3) Wash your face with an antiseptic/antimicrobial cleanser to remove oils, dirt and impurities. This will prevent any impurity from entering into your skin when you roll your skin. Clean treatment area again with rubbing alcohol to disinfect the area ONLY if you are using 0.5mm and above. Step 4) Optional: If you can’t withstand extremely mild pain, apply numbing cream to the treatment area. I suggest using Dr. Numb Anesthetic Cream. Important Note: before treatment, you must clean off the numb cream and disinfect the treatment area with isopropyl alcohol. Step 5) Using gentle to moderate pressure (DO NOT force it), roll the device back and forth 2 to 4 times in different directions (vertical, horizontal, diagonal) while pulling the skin slightly with one hand. This will ensure easy penetration of needles into your skin. Please refer to the picture below. Please be patient when treating around Hard-to-Reach or sourrounding eye areas. To ensure you don’t irriate your skin and maximize coverage, roll back and forth with gentle to moderate pressure. Do not drag across your face with unnatural movement of the roller. This can lead to scratches. Do not roll forcibly as this can lead to prolonged inflammation, irritation and recovery time. You should always roll with controlled motion with gentle to moderate speed in order to prevent slippage. By doing so, you can easily detect a defective roller that is either stuck or not rolling properly. You should NEVER roll forcefully with excessive speed. By doing so, you will not able to notice if the roller is stuck or rolling properly. As a result, you will end up scratching your skin. 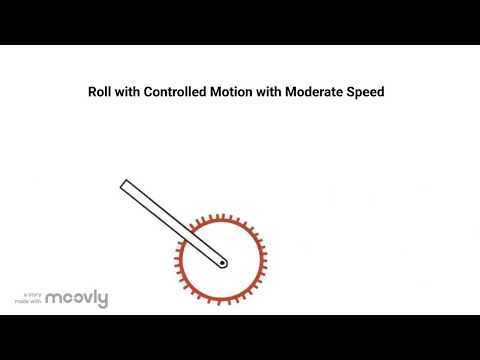 Please watch the 2 videos below to compare the difference between moderate and excessive rolling speed. Step 6) When you finish rolling, wash your face with a gentle cleanser to remove all traces of blood. This will improve absorption of your topical product. Step 7) Optional: You can apply antibiotic cream to speed up the healing process. Polysporin or Neosporin cream is recommended. Step 8) Optional: Skin needling boosts the absorption of topical products tremendously. You should nourish your skin with your favorite skin care product (moisturizer, wrinkle cream, scar cream and anti-aging cream) immediately after treatment. This will improve your results by 100%. Never apply topical products that contain irritating or toxic ingredients such as chemical peels immediately after a treatment. Step 9) DO NOT wear makeup, sunscreen or tanning lotion immediately after treatment. These 3 products are not for deep skin treatment. They can enter deeply into your skin through the micro-punctures/micro-channels and cause an infection. Wait at least 24 hours for your micro-channels to close up before applying makeup, sunscreen or tanning lotion. Step 10) You will notice a slight reddening of your treatment area. It is 100% NORMAL. This indicates that your skin is trying to regrowth new collagen. The redness will fade away after 2 to 7 days depending on the aggressiveness of your treatment. If you go outside during this period, please APPLY SUNSCREEN. How to Hold Dermal Roller Correctly? Several people complain that the needles can not penetrate the skin efficiently because the roller has too many needles. In reality, this is totally untrue! Many people hold their rollers incorrectly and produce minimum downward pressure. This leads to poor penetration of the needles. You should put your “index” finger on top of the roller handle when you dermaroll. This will produce maximum downward pressure, and the needles will penetrate your skin easily. Please look at the photos below for reference. How to Clean Derma Roller? You must clean your roller after each treatment. Follow the simple steps below. Step 1) Disinfect or sterilize the roller head for 20 to 30 minutes. Isopropyl alcohol or denture tablet is recommended. Please do not clean your roller with a spray bottle filling with water or alcohol. This will not clean your roller effectively. Boiling water can kill bacteria and germs, but it can damage your roller by melting its plastic. Stay away from boiling hot water! Step 2 – Optional) Brush your roller head with a Clean or New “soft bristle” toothbrush under warm water for about 1 minute or until you are satisfied. This will remove dirt and oils that alcohol cannot remove. For hygienic reasons, please DO NOT use a toothbrush that you used for brushing your teeth!! Step 3 – Optional) Gently roll your dermaroller back and forth on top of a wet sponge. This will also clean off all dried residues including dirt and oils that alcohol cannot remove. Step 4) If you performed Step 2 or Step 3, then rinse your roller under hot running water. Step 5) Let it air dry and store it away. How often to Use Derma Roller? Warning: Many inexperienced users recommended few treatments per week. This is HARMFUL and IRRESPONSIBLE! This can damage your skin. You should NEVER have more than 1 treatment with 0.5, 0.75 to 1.0 mm needle size and above within 1 week. Important Note: Your skin requires at least 30 days to fully recover. You should NEVER start another treatment within 4 weeks. In doing so, you will damage new collagen fibers and minimize skin development. The secret to getting tremendous skin improvement with 0.5, 0.75 to 1.0 mm and above needles is to treat your skin every 4 to 6 weeks. Please follow the simple dermarolling guideline below in order to minimize side effects. If your skin is still red or irritated from the previous treatment, you should never start a new treatment NO matter what the guideline stated below. Your skin must be fully recovered before another procedure! 0.5mm – Use Once/Month or every 7 days ONLY if your skin can tolerate weekly treatment. 0.75mm – Use every 4 to 6 Weeks or Twice/Month ONLY if your skin can tolerate multiple treatments. 1.0mm – Use every 4 to 6 Weeks or Twice/Month ONLY if your skin can tolerate multiple treatments. 1.5mm – Use every 6 to 8 Weeks ONLY with professional supervision. 2.0mm – Use every 6 to 8 Weeks ONLY with professional supervision. If you are a beginner and unsure what to use, you should stick with 0.25mm and use it every other day, or you can use 0.5mm every 4 to 6 weeks. How to Use Multiple Derma Rollers for Acne Scars & Wrinkles on the Face? Below are 5 treatment schedules for treating acne scars or wrinkles with multiple rollers. These guidelines are for educational purposes only. These sample schedules illustrate the use of 0.5mm with 0.75 or 1.0mm microneedle rollers in 1 month. To minimize side effects, NEVER have more than 1 treatment daily and DO NOT treat the same area with various needle sizes in 1 session. “Work Day” means you DO NOT treat your skin due to work. If you do not work that particular day, you also DO NOT treat your skin. “Off Day” means you DO NOT treat your skin that particular day. “Recovery Day” means you DO NOT treat your skin. 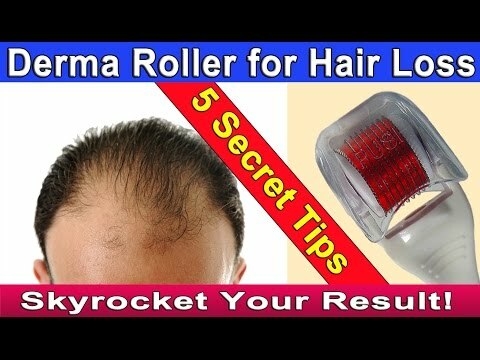 How to Use Derma Roller for Hair Loss or Hair Growth? Many research studies have proven that microneedling can actually regenerte new hair follicles and thicken your hair. It can also increase the absorption and efficacy of your topical hair regrowth products and prevent hair loss. The discussion of this topic is too in-depth for this article, but you can read the full article and watch the introduction video below to reduce hair loss and trigger hair growth. How to Use Derma Roller on Stretch Marks? I hate stretch marks, and I have spent a fortune on many topical creams. None of them work because they can not absorb into the skin effectively and stimulate collagen production. Treating stretch marks is the same as treating any other skin conditions except you might need longer needles. You should treat your skin every 4 to 6 week. This allows your skin to fully heal by reducing all inflammation. You wll definitely see improvement with derma roller treatment, but smaller needles (0.25 to 0.3 mm) with not be effective. The most effective needle size are between 0.5 to 2.0mm depending on the severity of your stretch marks. I personally have used 1.0mm with very good success. Derma rolling stretch marks is definitely not a quick fix and please do expect immediately results. You should expect an average of 4 to 8 months (about 6 to 8 treatments) before seeing noticeable improvement. My stretch marks are less visible now, but they are still there. I do not believe that microneedling can completely eliminate the appearance of stretch marks, but I am very satisfied. Some users might experience immediate skin plumping as blood and growth factors are rushing into the treatment area. This is only temporary. It will disappear after several days. You will experience permanent reduction in wrinkles, scars and stretch marks by the third treatment as new collagens are repairing your skin. Many users reported seeing over 60% improvements after approximately 6 to 12 treatments. Below is a video with before and after pictures. You can visit her Youtube Channel for more Information. Below are important reminders for before and after treatment. You really should follow them. Avoid using irritating topical product if your skin is experiencing discomfort (ex. Redness) from the previous rolling session. Below are before and after photos to illustrate what can happen after a rolling session. It was done with a 0.5mm roller rolling in various directions about 2 to 4 times. Please note that you should never use your roller recklessly. You might experience slightly different results due to skin sensitivity, the aggressiveness of your procedure and the speed of your healing process. Important Note: To avoid the formation of needle marks (aka track marks), you should never roll forcibly or aggressively! Redness developed that resembled a mild sunburn. Skin felt slightly inflamed and tight. Few needle marks were also developed due to unintentional aggressive rolling. 24 Hours After Treatment – Redness slightly subsided. Skin felt less inflamed and tight. 48 Hours After Treatment – Redness and needle marks faded by 40 to 50%. 72 Hours After Treatment – Everything faded by 50 to 60%. Day 4 – Everything faded by 60 to 70%. Skin did not feel inflamed and tight anymore. Day 5 – Everything faded by 70 to 80%. Day 6 – Everything faded by 90%. Day 7 – Redness and track marks were all gone. There are 6 side effects that are commonly reported by users. They are harmless and 100% NORMAL. They are listed below. Mild bleeding is very common during treatment. DO NOT PANIC! Wash your face after the treatment to remove all traces of blood. You will notice a few tiny red spots. They will disappear after 24 hours. 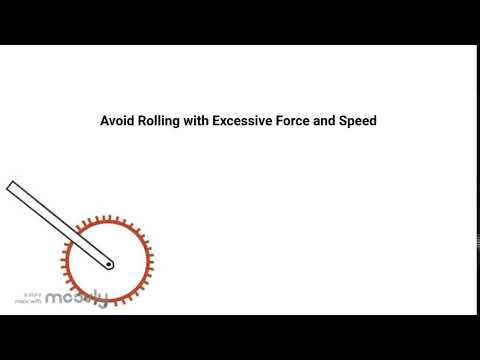 Many people believe that aggressive rolling can produce better result. This is completely untrue! Rolling forcibly will irritate your skin and produce temporary needle marks. They are usually harmless. They will disappear in 1 to 7 days depending on the aggressiveness of your treatment. Everyone experiences mild redness and swelling after the treatment. This is an indication that your skin is rebuilding new collagen fibers. They will usually disappear between 48 to 72 hours. Avoid going outside or wear a sunscreen during this period. Skin needling breaks down and exfoliates the top surface of your skin. Also when you dermaroll, your skin will lose moisture. As a result, you will experience skin dryness, tightness and peeling after a few days. This is very common. You will notice a smoother, evenly toned complexion after the peeling process. You will experience a mild sensation of sunburn after a treatment. This is quite normal. It will disappear in several days. Do not use any scrubbing product until your skin is fully recovered. Dermaroller stimulates new collagen production by breaking down old scar tissues and wrinkles. This produces mild popping noises. This is perfectly normal. A common problem with home microneedling treatment is the risk of overdoing it with aggressive rolling because many users want quick results. In doing so, your skin is in a constant state of inflammation and can not recover fully from previous treatment. Consistent inflammation can trigger stress hormones, slow down skin repair and limit collagen growth. This will lead to the breakdown of collagen and skin breakouts. Therefore, it is best to wait for your skin to fully recover before a new treatment. Abnormal or excessive usage of 1.5 to 2.0 mm rollers on a weekly or even daily basis is highly not recommended. This is completely wrong and can lead to prolonged inflammation. In doing so, you are at risk of getting collagen damage and swelling. You should seek professional advices before using a roller with longer needles and only treat your skin every 4 to 8 weeks. PLEASE use 1.5 to 2.0mm rollers responsibly and avoid weekly or daily treatment. You should never apply topical products that contain irritating or toxic ingredients immediately after a treatment because they can bypass your epidermis and enter directly into your skin. In doing so, you are at risk of boosting toxicity or irritation in your skin. Consult your doctor if you are unsure about your skin care product. Should I Use My Derma Roller Daily? It is never a good idea to treat your skin excessively. Only 0.25 and 0.3mm rollers are designed for daily treatment because the needles are not long enough to cause micro trauma. However, if you are experiencing prolonged irritation, then it is best that you only treat your skin every other day. 0.5mm, 0.75mm, 1.0mm and 1.5mm rollers are designed to cause micro trauma in your skin, thus causing mild inflammation. As a result, you body produces collagen to repair the trauma. However, inflammation also produces a protein called collagenase, which is responsible for breaking down of collagen. Daily treatment with these rollers (0.5mm, 0.75mm, 1.0mm, 1.5mm) will create prolonged inflammation, thus producing an extra amount of collagenase. This will cause more collagen to breakdown than usual. Therefore, it is not unusual to experience the loss of new collagen. It is best that you do not treat your skin daily with 0.5 to 1.5mm rollers. If you do not want to use (0.5, 0.75 or 1.0mm) all the time, you can give your skin a break by taking more than several months off. Also, you can use 0.25mm between treatments of 0.5, 0.75 or 1.0 to improve the absorption of your serum or cream. Please follow the guidelines below. Wait several days after your treatment of 0.5, 0.75 or 1.0 before using your 0.25. If your skin is still experiencing irritation/redness after a treatment of 0.5, 0.75 or 1.0, do not use 0.25. If you want to apply cream or serum after a 0.25 session, please make sure the ingredients are not irritating, toxic or comedogenic (pore clogging). If your skin is still experiencing irritation/redness from your previous 0.25 treatment, do not use 0.25 again until all redness or irritation is subsided. If you want more information on how to use dermaroller at home. You SHOULD check out the topics below. Learn how to use dermaroller for acne scars, wrinkles & stretch marks. Discover how to pick the best skin roller. Get 10 most frequently asked questions. This is a MUST READ before micro needling treatment. Does derma roller really work? There are hundreds of positive testimonials on Amazon.co, and many people reporting seeing results with only 1 treatment. Is it suitable for you? Read and find out. Does skin needling really regrowth new collagen and fill in wrinkles, scars and stretch marks? Discover the 7 latest facts now. What is the Best Dermaroller? DO NOT buy another derma roller until you read this first! A poor quality roller produces minimal result. Discover how to pick the best dermaroller for under $30. This is a review of 7 common skin rollers. Uncover their Pros and Cons. Discover the best dermaroller on the market NOW! Discover the most reliable place to buy a roller. If you have a question related to derma rolling, you can find it here! Are you looking to try skin needling? Read these common complaints before buying your first dermar roller. Is Microneedle Roller Safe for Home Use? Derma rollers are very popular for anti-aging therapy. Are they safe for home use? Can they treat your skin problems? Read and find out. Discover 10 simple skin needling tips to smoother, younder skin with zero side effects. Easily look younger and prevent skin aging quickly without spending a fortune. Easily improve your derma roller results by 150% with 6 powerful secret products. Quickly reduce wrinkles and scars. Top anti-aging secrets revealed. Does Microneedle Roller Really Work for Acne Scars & Stretch Marks? Microneedle Roller is a new anti-aging device that quickly reduce blemishes. Does it really work for acne scars and stretch marks? Is it safe? Numbing cream can eliminate discomfort during a microneedling session. Learn 8 easy steps to 100% safe and pain free microneedle roller treatment. Does microneedling work? Is micro-needling better than chemical peels, laser and microdermabrasion for under $30? These 10 benefits will shock you! Microneedling can cause side effects. Follow these Pre microneedle instructions if you have abnormal skin conditions, have taken certain medications or had certain cosmetic treatments. Microneedle Roller Vs Cosmetic Treatments – Who is #1? Microneedle roller offers skin rejuvenation benefits. Is it a better treatment than laser, chemical peels, botox, fillers, microdermabrasion and etc? Discover what to expect after micro needling. What are the side effects? Following these instructions after a micro needle treatment will produce awesome results. I spent many days creating this blog post on how to use derma roller at home. If you enjoy it, please give me a facebook like or social share it below. Love this product really dose make a difference in my skin. I love the derma roller. I just finished my treatment a week ago, and I already love doing it, I can already see results. Thanks for this information. Great article, very comprehensive. I am not sure which derma roller size to use for more effectiveness and reduction of my age long hyperpigmentation caused by chicken pox when I was young. I am noticing good results since I started using the 0.5 sized derma roller about 3 months ago. However, I think I might need to try out a different size this time. At the initial stage of my derma rolling I made a mistake of doing it more frequently than twice in a month or once in a month but later got the right timing. Vitamin C serum is extremely drying. Don’t we need moisture after rolling? Thanks! Vitamin c serum can be irritating for people with very sensitive skin. You can apply hyaluronic acid serum for moisturization. It will absorb into your skin very quickly without oiliness. You can also use vitamin c serum that contains hyaluronic acid as ingredient. You can try vitamin c serum, copper peptide serum or Retin A cream. Please do not use Hydroquinone. Hydroquinone is known to cause skin cancer, and derma rolling can increase the toxicity of hydroquinone. Also, Retin A cream is known to cause redness and irritation, and you should use the mildest concentration. I want to know that can dermaroller for hair redevelopment may also apply for healing deep pores of cheeks? Yes you can, but skin needling might not be 100% effective for clearing up large pores because your pore size is determined by your genetic. Hi, your article is very informative. Ive been reading articles about derma rollers. and afraid to try one. 🙁 But I’m planning and wanting to do it. I don’t know where to buy the derma roller and the creams needed. please help me and advise me on this. Thank you. It is ok. Derma rolling is scary as first. If you are uncomfortable with it, you can always try 0.25mm first. It is absolutely painless. But, i don’t think that the 0.25mm can work for deep pores , if so, for how long would i use it? No, it does not work for deep pores, but it can help boost topical product that treat deep pores. I hope that helps. I started with a 1mm derma roller this week. I used a good C serum afterward, but I’m having a hard time finding information on how often to use the serum between treatments. Do I apply daily before bed, or for just a few days and then wait until I derma roll again, when I’ve opened up the skin? I found the article very helpful and informative. I am planing to use the derma roller 0.5 , I want to know if I can apply my dark spot corrector (which am currently using ) after the treatment and is also ok to use a face mask in the days of the treatment. Thank you for your advice in advance. Can Tretinoid gel 0.1% strength be used after a derma roller please? Yes you can, but it is best that you use the mildest strength such as 0.025%. Tretinoin is known to cause irritation, redness, dryness and peeling, and skin rolling will increase the effects. Hello, I just ordered my Derma Roller 1.5 mm because I have really bad scars on my face from my past acne and I was wondering if Emla 5% (numbing cream ) is good ? Also I bought Estee lauder advanced night repair serum and Caudalie Anti- macchie serum for morning and night did I choose wisely or no ? Great article! I have both the 1.0 mm and the 0.5 mm dermarollers. I derma roll with the 1.0 mm once a month; is it safe to use the 0.5mm roller once a week until my next 1.0 mm treatment? How do I know when my skin is healed from the first treatment? Thanks! There is no need to rush. Less is better for skin rolling because your skin has to heal to see result. You should wait 2 to 3 weeks after your 1.0 mm treatment before starting a new 0.5 mm treatment. Your skin is healed when you do not experience redness, dryness, peeling and irritation, but if you were using 0.75 to 1.0mm, it is best to wait 4 to 6 weeks before a new 0.75 to 1.0 mm treatment. I have rosacea and really want to start dermarollering with a 0.5. What would you suggest I put on either before or after dermarollering? And how often should I use it? Thanks for your help. Hi Heather, Please NOTE that if you have pustular or nodular rosacea, then you shouldn’t dermaroll. For topical product, you can try Hyalauronic acid serum or you can read my article on 6 Powerful Skin Care Products For beginner, you should use roller once per month. Thanks for your precise instructions on using derma roller at home. I didn’t find so complete guidelines in Persian sites. Hello i have really bad deep acne scars i wanted to try derma rolling but don know if i should start with a small needle size or just start with the 0.75 mm since ive read thats what you need to use for acne scars ..and can i use any collagen cream and or vitamin c ? If you are a beginner, you should start out with 0.5 until you are fully comfortable with rolling. 0.5 can produce similar result that you can get from longer roller. I do not know what is in the collagen cream. Therefore, I can not recommend it. Please Note that all ingredients in your topical product MUST not contain irritating or toxic ingredients. Vitamin C serum is a good alternative because it is proven to stimulate collagen production. I have a burned scar in my face for long time about 26 year. I use glycolic 70% gel peel once per week. And i have also started with dermarllor 1.0mm every 2 week. Is there any problem to use both products in different times? Or should i stop the glycolic peel? 70% glycolic peel is very strong, and it is made mainly for body treatment! You shouldn’t use it once per week but once every 4 to 12 weeks. You should never apply any chemical peel immediately after a derma roller treatment. By doing so will drastically increase irritation, redness, itchiness, peeling and can even cause a breakout due to inflammation. Also, you shouldn’t perform any invasive treatment (peels) until your skin is fully recovered from your rolling session (4 to 6 weeks). Please Note that once you perform invasive treatment (peels, Laser), you should stop rolling your skin until it is fully recovered from chemical peels ( 4 to 12 weeks). This will minimize any potential side effects. Hey! I’d just like to thank you for this. I have purchased a 1mm dermaroller, and it was very cheap. Under 10$ cheap, so I was a bit uneasy about using it. It looked fine, everything seemed normal. Needles seem to be 1mm, they’re not bent nor anything wrong with it. Anyway, I did as instructed with it on my face, and even tho it’s quite painful and I get very red, I don’t bleed at all. Not the slightest… clearly I’m missing something here and I’m not sure if it’s cause the roller was very cheap or maybe there’s something wrong with me? I hate to say this, but some cheap rollers work just as well! The problem with cheap rollers is that they don’t last long, or they usually arrived broken or poorly constructed with cheap plastic. If there is nothing wrong with your roller, then it is fine. I used to pay over $100 for a roller, but nowadays you can get a roller under $40, and they work just as good or better. Also, you do not have to bleed to see result. If you are using anything under 1.5mm, then you rarely bleed. If you have thick skin, you probably won’t bleed at all. Please Note that people on the youtube videos that were bleeding were using 1.5 to 3.0mm with professional supervision. I don’t recommend using them. often it is stated, that you should also sterilize your skin before the use of the dermaroller. Yes, you are supposed to wipe your face with alcohol, but many people find it irritating and drying. As a result, you should clean your face with a gentle cleaner, thus removing dirt, oil and impurities on your skin. This will stop them from entering into your skin through the micro channels, thus preventing infection. Why can’t you use if taking antidepressants? Certain drugs can slow down the healing process and recovery time. I am on accutane at the moment and would like to use the dermaroller for the stretch marks on my body. Above you say to not use it on accutane. Why is this? I’m still confused on how to roll over each area properly. You show 4 directions so does that mean each surface it run over 4 times but different ways? Is there a video of a tutorial on how to roll over the skin? I don’t want to over do it. You roll 2 to 4 times in each direction. For example You roll up and down once in vertical direction, and that is 2 rolls already. Then you roll back and forth once in horizontal direction, and that is another 2 rolls. You can actually skip rolling diagonally if you are using a roller with 540 needles since it can provide a complete coverage with just vertical and horizontal motions. Do not use it daily. You can only use 1.0 mm every 4 to 6 weeks, but you can use 0.25mm daily. Can I use my 0.5 dermaroller for all the 4 treatments or do i have to use a new one each time when i go for treatment? Yes you can reuse the roller as long as your disinfect the roller before usage. Each roller should last at least several months. Till when can i see the positive affects of dermaroller? Your result depends on the severity of your skin condition. Usually you can experience slight result with just 1 treatment due to skin peeling, thus reducing rough skin texture. For moderate to severe skin condition, 6 to 10 treatments are required to see noticeable results. sir I got stretch marks 4 yrs ago..which size derma roller should I use to get effective results? thank you so much for this informative article..
im using dermamelan depigmentation . i stop one day after and before rolling my face.. is that right? is it useful to use derma roller on my hands? and how? can i switch between the serums .. by putting one serum in a session and put another one the other session? If you are unsure about the ingredients in your topical product, you should use it 24 hours after your skin rolling treatment. You can perform dermarolling on your hand and anywhere on your body. You perform the procedure exactly the same way as your face. Also, you can definitely use different serum for different session as long as the serum does not contain irritating, toxic or comedogenic ingredients. For a partial list of undesirable ingredients, please scroll up read “11 Mistakes to Avoid”. I actually used clindamycin and tretinoin before. They are good products, but they are very drying to your skin. You can apply the products 24 hours after your dermarolling session. Also, you can try “Dr Roller”, but is is quite expensive. You will be paying about $50 to $100 for just 1 roller. Like others, I have some questions as well. I have never derma rolled before and I was thinking of starting with a 0.5mm. My skin is very weird, it is sometimes dry and sometimes oily (it can never make up its mind). I have very slight scarring from chicken pox and few break outs. I usually use all natural home made masks on my face and it usually helps. I was wondering if I could use such masks after derma rolling to boost up the products? I usually use masks made with cucumber powder, papaya powder, sandal wood powder, turmeric, milk, honey and saffron. You have combination skin, and it is quite normal. I have never used facial mask immediately after a treatment before, and I do not recommend it because it can dry out your skin excessively, and any product that are very thick and pasty can clog up your micro-channels. It is best that you stick with simple products such as hyalauronic acid serum, vitamin C serum or even Vitamin A serum. If you are unsure, you can always apply your mask 24 hours after your derma roller treatment. Hi, thanks you for this useful information, nice writing, I wanna to ask ……I’m 23 years old man Arab not black and not white skin , I had skin injury on face some trauma , 4 months ago , I begin to use hydroquinine 2% serum.,1 month ago , to treat postinflimatory hyperpigmentation on face , there is a result good , but not totally removed, what I may do ??? Can I use dermaroller with hydroquinine to increase effect? NO! Since dermarolling can increase the concentration of all topical product within your skin, thus boosting toxicity if your product contains toxic ingredients. Hydroquinone is known to cause skin cancer, and you should never apply it immediately after your derma roller treatment. Please read my article on “11 mistakes to Avoid“. It has a partial list of ingredients you should avoid. very informative thank u i am going to purchase one that contains a head of 0.5mm for around the eye area and 1.00mm for the face it comes with 1.5mm now since i was reading in the article that it is not for use in the face. You can use 1.5 mm roller on your face, but it is best that you only “spot treat” your problem area and not treat your entire face with it. For beginner, I highly suggest you start out with smaller rollers until you know what you are doing. If you are treating your body, you can definitely use 1.5 mm. If you do not have deep scarring, 1.5 mm is not required. Many people see better result with just 0.25 to 1.0 mm, and I am not lying. If you are using a 540 roller, you can just roll in horizontal and vertical directions 1 to 2 times each. If you are using a roller with 180 to 200 needles, then you need to roll horizontally, vertically and diagonally 2 to 3 times each. i bought 1.5 roller to treat stretch marks on the chest , it is called mesoline roller and made in korea, it is not mentioned if it is titanium or not . do u know if this brand is okey? also i want to use it on my face to treat pigmentation, my questions are 1. how often can i use it on the chest to treat stretch marks ? 2. how long should i wait between treatments? 3. can i use it on my face ? if yes can u please give me the right instructions? 4.can we use derma roller to treat cellulite ? I never used Mesoline roller before, but I have used Dr Roller. It was quite good, but I will never pay more than $50 for just 1 roller because you have to replace it after several treatments due to the dulling of the needles. If you are treating your face, you should always start out with smaller roller of 0.25 to 1.0 mm. For 1.5mm, you can only use it ONCE every 6 to 8 weeks. You treat your face the same way you treat your body except you use a smaller roller for your face. who know nothing about this technique. I m 25 years old ,I have stretch marks on my legs and I badly want to get rid of them, I also have very sensitive skin,so m very scared to go for this method.Please suggest me if i should go for this and also proper needle size and a cream for post application. Can microneedling prevent future stretchmarks? Another thing is that if its possible to get rid of stretch marks then why not cellulite. If you are treating your body, you can use 0.5 to 1.5 mm. For beginner, I highly suggest that you start out with 0.5 mm until you are fully comfortable with dermarolling. For topical treatment, I can not give you a correct answer because many stretch mark creams do not work. I personally use Vitamin C Serum or Retin A (tretinoin) to boost collagen production. I do not think derma roller can prevent the formation of stretchmarks and treat cellulite. Cellulite is a fatty tissue and the needles are not capable of breaking it down. They are only designed to stimulate collagen growth. I received my first derma roller yesterday 1mm 509 needles and because I was so eager to use it I proceeded to use it without reading instructions. Had some redness and a sun burnt sensation which didn’t bother me, so I proceeded to treat myself to another derma roller this evening and again without no issues. Then I decided to read about how often I am meant to use roller and came across your site, which clearly states 4-6 wks before next treatment! Have I now damage my collengen and how can I repair the damage??? You should only treat your skin with 1.0 mm every 4 to 6 weeks. Few people treat their every 14 days, but I wouldn’t recommend it. If you treat your skin more than 1 per day, you won’t damage your skin, but you are at risk of getting side effects such as redness, irritation, inflammation, dryness and needle marks. Also, your skin will take longer to heal. Don’t worry, you will be ok. Just don’t do it again. Is it ok to use on your neck for wrinkles? I’m using Rectino AC gel (clindamycin 1%, Tretinoin 0.25%) on my face everynight. Today i bought 0.5mm Derma roller. I wish to try it. Is it safe to use my gel after derma roller? or do i need to skip on that day? Any other routine do i need to follow? You can use tretinoin. It can speed up shedding of your skin, unclog pores and stimulate collagen production, but it is known to cause side effects such as irritation, redness and sun sensitivity. Applying it immediately after a dermarolling treatment will increase the side effects. It is best that you only apply a tiny bit of tretinoin. If not, you should wait 24 hours before using it. could I use a roller 0.25mm to 0.5mm everyday around 8 with my skin care product. if not how long should I wait to use it again? You can use 0.25mm every other day or everyday only if your skin can tolerate daily treatment. For 0.5mm you should start out with only once per month, but you can use it weekly if your skin can tolerate weekly treatment without excessive irritation. I personally use 0.5mm once per month. What can u apply on your face before using derma roller and when can you start using your cream.is it adviceable to use a lightening cream after derma rolling. Can you also use derma roller to maintain and improve your skin . You do not apply anything before the treatment. You only apply your topical skin care product after your treatment when you create 1000s of micro-channels into your skin. The micro channels will allow your topical product to bypass your epidermis and enter directly into your skin in greater concentration. Also, you should apply your serum or cream no later than 30 minutes. For lightening cream, you should not use anything that has hydroquinone, kojic acid or anything that is toxic. For skin maintenance or improvement, you can use 0.5mm once per month or 0.25 daily/every other day with your topical serum or cream. I washed my 0.25mm derma roller once with boiling water (before I knew better), will this have caused damage to the needles and now I shouldn’t use it? If there is nothing wrong with your roller, then it is ok. Boiling water will not damage the needles, but it can damage the plastic drum holding the needles. Hey, can I use coconut oil on my face after rolling? And to wash the blood of my face can I just use water? Aaand I have small ‘bumps’ on my skin, not really pimples, I’m not sure how to explain but they’re veeery small, can only feel it when you softly drag your fingers over them, should I avoid them? Cause they’re like all over my forehead. I am not 100% sure about coconut oil. It is definitely not toxic or irritating, but if the oil can clog up your pores, then I would not use it immediately after a treatment. Also, you can use warm water to wash your face, but I usually use a very gentle cleanser such as “Cetaphil” For your bumps, if they are not pustular pimples, they are probably whiteheads, and you should roll around them. I did my derma roller 1mm 2 days back. I had severe post inflammatory pigmentation after excessive laser treatments. I have used hydroquinone 4% & retinol A to clear it in the past. After treatment my face turned red. Is it normal? I used cetaphil moisturizer to moisturize it ,my dermatologist recommended derma roller to me. Plz help why I have dark complexion now will it go away ? Hydroquinone and Retin A are known to cause redness and irritation. It is normal. Also, you should not dermaroll until your skin is FULLY recovered from your laser treatments, and you should start out with 0.25 to 0.5 mm. Your result depends on the severity of your skin condition. Important Note: you should never apply Hydroquinone immediately after a dermarolling treatment. Never apply topical product with irritating or toxic ingredients. Fillers are only temporary, and your body break them down eventually. Also, 0.5mm is very good for fine lines. You can use it weekly, and it is less painful. On the other hand, 0.75 to 1.0mm can be used only once every 4 to 6 weeks. Redness and swelling do occur, and they will disappear in 2 to 7 days depending on the aggressiveness of your treatment. Personally, my skin usually took 7 days to recover. Yes, it is ok to use bio oil 24 hours after your treatment. Also, please make sure the product is non-comedogenic that does not clog pores or oily. Personally, I think hyalauronic acid serum is a better option for dry skin. It is non greasy and does not clog pores. I actually do the same exact thing. You can definitely switch to smaller roller and give your skin a break. Some people have several treatments of 0.75 to 1.0mm and treat their skin with 0.25 to 0.5mm the rest of the year. Thank you for the great information in this article! I just ordered the 4 in one kit from your website and can’t wait to try it. I’m 58 years old and have a lot of acne scarring, I have cystic acne still and of course wrinkles. I use and sell L’BRI products and use Aloe Vera Barbadensis Jelly as my moisturizer so I am using products that heals the skin from the inside out, which is really the only product that has helped me and I don’t break out that often anymore, maybe twice a year. Is ok to use the derma roller with breakouts? I am battling a cystic blemish and want to make sure it is safe to use when I get my kit. Thanks again for your info, I now know how to use it correctly when it arrives. If you have active acne, you can roll around the pimples. If you have pustular acne, DO NOT roll into it, or the needles can pick up the bacteria and spread them around your face. If your pimples are not pustular, you can treat them with 0.25mm to boost absorption of your topical product and speed up recovery, but you SHOULD NOT use anything longer than 0.25mm. I have keloid scar and acne scar on my face both sides …..can I take derma roller treatment or not? DO NOT dermaroll keloid scar. Keloid scarring is an abnormal skin condition, and dermarolling will make it worst. I am using 0.5 mm derma roller. Can I use Aloe Vera gel after derms roller treatment??? please help me out. You can apply any product only if it does not contain irritating or toxic ingredients. I highly suggest you to read “5 derma rolling dangers” and understand which ingredients are not suitable for immediate application after a treatment. What is the best size for under the eye wrinkles and crepey skin? Is it effective in this area? Can you recommend a retinol eye cream? I am in the U.K.
For wrinkles under the the eyes, you want to use smaller rollers of 0.25, 0.5 or 0.75mm becuase these areas are extremely sensitive and fragile. Stay away from long rollers! I don’t use retinol cream for they eyes because retinol can cause dryness, peeling and redness. I personally use a serum with vitamin C with hyaluronic acid. I am thinking about buying these rollers.. I am really wanting to target the under eye area, specifically for the bags under my eyes! Is the roller effective for that? Derma roller treatment will not be effective in reducing bags under your eyes. The bags under your eyes are caused by diet, genetic and stress. The treatment can only target fine lines and wrinkles around your eyes. Also, you should stick with smaller roller such as 0.25 to 0.75mm. I really am grateful for the info on this site. I am 48 and my skin has started to lose elasticity, I have scarring and my pores seem to get larger every year. I had a terrible second degree sunburn from a sunlamp when I was 20 years old, and I am paying for that with my skin condition now. It is all very disheartening, so I have decided to give Derma rolling a try. I rolled with 1mm all over, and also used a dermastamp 1.5 on my worst areas. I’m keeping my fingers crossed. Should this help with enlarged pores? My skin does not heal properly any more either. If I get a blemish, it will leave a pit, I’m guessing from lack of collagen. Should I do my treatment once monthly? Do you recommend any other type treatments in between derma rolling? Also no blood was visible with my treatment. I have seen some pictures of bloody faces after rolling. I hope I am treating properly! Sorry so long, and thanks again for the great site. If you are using 1.5mm, you REALLY should use it once every 6 to 8 weeks because you need to let your skin to recover. You can only treat your skin daily with 0.25mm. You can also try LED facial mask with red led lights which are proven to speed up healing and promote collagen growth. I personally use it for 15 minutes per day. It is non-invasive and will not damage your skin. Dermarolling might not be 100% effective on treating large pores. Your pore size is controlled by your genetic. You should use a smaller roller of 0.25 to 0.5mm to treat large pores because they can speed up the thickening of epidermis, thus minimize the appearance of large pores. Also, bleeding is not necessary to see results. Please do not misuse the roller. Doing so can product side effects such as swelling and cuts. Thanks for the response. I have a lightstim red light I use nightly, is that ok do you know? I think my pores are a result of the severe sunburn. They actually will join together to create a line. Just awful. I will try a .25 and .5 as well. There is so many different suggestions online for dermarolling it is confusing. It seems some people do it a couple of times weekly, using longer needles. I know there needs to be recovery time though. Yes you can use it nightly. Lighstim uses LED lights. They won’t harm your skin, and they can boost healing and collagen production. I have a similar product called LED facial mask, and I use it everyday for 20 minutes. For a large pores, you should stick with smaller roller of 0.25 to 0.5mm. Also, derma rolling can not completely remove large pores because your pore size is genetically determined. DO NOT perform treatment several times per week with 0.5 to 1.0mm. You can only perform daily or every other day treatment with 0.25mm. Hi i just bought a derma roller with a size of 1.5mm, its my first time to use this to treat my old scar on my knee. Is it ok to use this needle size? Thank you. If you are treating your body, it is ok, but I still think you should start out with 0.5mm until you know what you are doing. I am currently getting needling done on my face for acne scarring at a laser clinic in. I’m not sure of the size of the needles, however the clinic have given me a home roller to take home and use daily in between the 6-8 week period of recovery. Is this something I should be doing? I assume the needles are the very small as it doesn’t hurt very much. My skin seems to be fine by the next day. But I’m not sure if I am suppose to be doing this during the space in between of getting the larger needles done professionally. It is optional, but it is best that you give your skin 1 week rest before doing daily treatment of 0.25mm in order to prevent irritation. Thanks!! I usually do give it about a weeks rest because it’s too swollen and red to start straight away. Then I will start daily. As long as it doesn’t interfere with the recovery period. It will not interfere with the recovery process unless you are using 0.5mm and up. Hi! I read your article and it’s nice to know the information regarding on how to use it. I am planning to buy a derma roller to treat my stretch mark around my belly and thigh. What size is better for those area? Thanks! For body treatment, you can use 0.5mm and up depending on the severity of your stretch mark. Since stretch marks are very difficult to remove, it is not uncommon to see result after 3 to 8 treatments. I just receive my derma roller, and i used it already.. then after i used it.. My face got ret and itchy.. is it normal?? Thanks. Yes, it is perfectly normal. You will also experience mild skin peeling after several days. Redness, itchiness and dryness will go away after 3 to 7 days depending on the aggressiveness of your treatment. If you recently had filler injection,then you shouldn’t perform derma roller treatment on the treatment area because it can break down the filler. I used my derma roller yesterday and after i finished a strange fluid kept coming out, the kind like when you keep playing with a spot and a clear fluid comes out, is this a normal reaction or have i over done it? This usually happens when 1) using a roller of 1.5mm and above or 2) performing very aggressive treatment. It is ok, and you should be fine. This is the reason why you should use a smaller roller at home. Is it normal that i feel burning sensation and itchiness around the area that i rolled? I rolled more than i should on every area coz its my first time and i didnt feel the needle when rolling the first time. And can i ask when can i workout on the gym every treatment? Yes it is perfectly normal. You will also experience mild peeling after several days. You can workout after treatment, but I usually don’t do it until after several days when the irritation and redness subside. Hi I just ordered my derma roller 2 hrs ago…Just wanna ask if its allowed to put make up after 24 hrs of using derma roller??? is it safe? After 24 hours is ok, but you shouldn’t use too much because your skin will still be irritated, and you don’t want to agitate it. I’m really confused on whether to buy vit C serum as it is very expensive here and using retin-a cream takes long time to show any signs of collagen production. Is buying vit C serum more important for pitted scars and to use it after dermarolling with 1mm or should I stick to retino-a cream ? This is a tough question because they are both very good products. Retin A takes long time to trigger collagen production because it can not absorb into your skin effectively without derma rolling. With Derma rolling, you will definitely see faster results with it. If you want to boost collagen production with the added benefits of skin peeling, unclogging pores and reducing hyperpigmentation, then Retin A is ideal, but it is also well known to cause redness, irritation and sun sensitivity. I personally use vitamin c serum to avoid side effects from Retin A. Can i use vitamin c serum immediately after derma rolling or i shoud use use it in the night? Or what shold be used immediately after rolling? Yes, you can use vitamin c serum immediately after a rolling session. Also, If you are going to apply topical product immediately after a treatment, please make sure your product does not contain irritating/harmful/comedogenic ingredients. (For example. saliyclic/glycolic/tca acid, hydroquinone, kojic acid, etc) If you are not sure, you should use it next day. If your product has peeling agents, then you should wait about a week before usage. Can I use it if i’m on acne medication? I take tablets called Lymecyline and was wondering if it will affect the treatment. I never used Lymecyline before so I can not speak from my experience. If the medication can slow down healing, weaken skin structure and induce hyper/hypo pigmentation, then you shouldn’t dermaroll until you are fully off the medication. If Lymecyline is similar to Accutane, then then answer is definitely no. Can i use vitamin c serum immediately after rolling or shall i wait for 24 hours? You can use Vitamin C Serum immediately after a treatment only if it does not contain harmful ingredients. I personally use vitamin C serum made by Skincueticals or Dr Perricone MD. I appreciate all of this valuable information. Just got my derma roller and Pure Body Naturals Vitamin C with Hyaluronic acid and Vitamin E. I plan to start this program upon returning from a short trip. Will continue to check in here! hi i want to buy derma roller but i dont know what size of the needle i will start i have. i just want to use derma roller for my stretch mark and the scar on my forehead due to chicken pox it’a abit deep. can you advice me if what needle should i use to start? So i clean my face with a cleanser and water and use dermaroller and then clean my face again with hot water and use vit c .. Is it ok? And can i use only 0.5 for my face, hair and skin? Can i use the same dermaroller more than 6 months and once a week? That is correct. You clean off the residues on your face with a gentle cleaner before applying vitamin c serum, thus preventing impurities from mixing with the serum. You can use 0.5 on your face, body and hair, but you should only use it every 4 to 6 weeks. Hi i have just started using 1.5 mm derma rolling for hair loss specially. And i also tried for the face but i see no bleeding and face no extreme pain as people use to say that 1.5 mm does. So just it doesn’t hurt me i can derma roll every alternative days. My skin type is black, sun burn, oily , old acne marks and thick. Is it normal that i don’t bleed at all? And can i do it every alternative day? I do not know who gave you the incorrect information, but DO NOT EVER treat your skin every other day with 1.5mm. That is completely wrong, and I do not approve the use of 1.5mm unless you have professional supervision. Use it ONLY every 6 to 8 weeks. You can only use 0.25mm every other day. It is normal that you do not bleed because some people have more fatty tissues around the cheeks. DO NOT judge your result by how much you bleed. Do not force your skin to bleed via excessive rolling. This can lead to side effects and breakdown of collagen! I just bought a .50 roller and can’t wait to use it. My question is, can I use makeup as usual the next day or is there a time period that we should wait? I also have a cream that is Vitamin C 6000 w/retinol and one of the ingredients says that it has phynoxyethanol…is that the same as phenol? Thanks and love the page!! You should wait 24 hours before applying makeup or sunscreen. I am not sure about phynoxyethanol. I don’t think it is phenol. Phenol is a super strong chemical peel that is used by Plastic Surgeon. It is extremely painful and can cause scarring if use incorrectly. I LOVE this page so much good info for EVERYTHING I HAD QUESTIONS ON! So for my body I’m going to use a derma roller because I have stretch marks. So what oil or lotion would you suggest me to apply after I use the derma roller? Also, for my face once I am done using the derma roller what can I apply? For stretch marks I do not use any special oil or lotion because most products do not work. You can use product that are proven to stimulate collagen production such as vitamin c Serum or Retin A. Please note that ALL TOPICAL products must not contain irritating, toxic or comedogenic ingredients. Oil is not recommended because it is comedgogenic and can clog up pores. For your face, you can also use Vitamin C serum, Retin A or Hyalauronic acid Serum, but you do not need to use them all at once. I am really confused as to what to do post dermaroll. Do I use my Vitamin C with hyaluronic acid or my copper peptide serum with growth factors? And also, do I only need 1 or the other or both? You do not need to use more than 1 topical products. Doing so will increase irritation and probably will clog up your pores, thus causing blackheads and pimples. I personally use Vitamin C serum with hyaluronic acid. I don’t use copper peptide serum because it irritates my skin. I read your article and it is very useful. I had a dermaroller session 3 days ago. My dermatologist rolled it over face with 1.5 mm needle. My question is I am still having the redness after 3 days and it is looking like mild sunburn, will it heal, or is it forever. Because I have heard that normally the redness will go after 1 or 2 day of treatment. Redness is very normal. If the dermatologist were using 1.5mm, redness or sunburn irritation will disappear in about 5 to 10 days depending on the aggressiveness of the treatment. Redness will go away in 1 or 2 days ONLY if you use 0.25mm roller. I read in your article that grapeseed extract may be taken as a supplement to improve results, but may I use cold pressed grapeseed oil on my face immediately after treatment? Grapeseed extract is an awesome antioxidant with anti aging benefits, but I don’t think you should apply grapeseed oil immediately after your rolling session because oil is comedogenic! Never apply anything “immediately” after a treatment that is irritating, toxic or comedogenic. If you must use grapseed oil, you should wait 24 hours after your treatment. hi sorry but i didnt get your schedule for 0.75mm, the work day means im going to use it that day? your schedule also shows that im going to use it since monday to friday but then i have also read that 0.75mm is not good for daily use because it might breakdown use your collagen. its my first time to use derma roller. You only use 0.75mm every 4 to 6 weeks. The work day in the sample schedule means you DO NOT do any treatment that day because you have to work. You can only use 0.25mm every other day or daily only if your can can tolerate daily treatment without excessive irritation, redness or dryness. Daily treatment of 0.75mm can definitely cause excessive inflammation that will lead to collagen breakdown. Please DO NOT USE IT DAILY! You should only use 0.5mm every 4 to 6 weeks. “Work day” in the chart means you do not treat your skin that day because you have to go to work. You can only use 0.5 weekly if your skin can tolerate weekly treatment without excessive dryness, itchiness or irritation. You can use the roller until you get enough results. I personally used it for about 1 year every 4 to 8 weeks for my boxcar scarrings. I’ve never used a dermaroller but am interested in trying it, how long should you wait after using an 0.5 mm roller to put makeup on? You should wait 24 hours before applying makeup. Ah question admin. Can i use 0.5mm dermaroller everyday and 1.5mm dermaroller every 6-8 weeks ?.. Is that ok?. Thanks. Do not use 0.5 everyday. You should use it every 4 to 6 weeks. ONly 0.25mm is designed for daily usage. Once you use 0.5mm, you should wait 4 to 6 weeks before using 1.5mm. I was on this blog trying to clarify the use for the derma roller but I still came up empty handed. What products should I use after derma rolling? Someone recommend me taking vitamin C and E (also use the oil), using a gycolic acid lotion and or pads, Aloe Vera, gold bond healing lotion and roc retinal cream. Is using a 1.5mm derma roller safe? I will be using it on my lower back, hips, thighs and behind my knees. SOMEONE PLEASE HELP THIS IS A CONSTANT BATTLE FOR ME. DO NOT apply any topical product that contain irritating, toxic or comedogenic ingredients immediately after a treatment. Ingredients such as glycolic acid, oil, hydroquinone, kojic acid, salicylic acid, TCA acid, acidic substances, toner and etc are not suitable for deep absorption. Applying these ingredients after your treatment can boost irritation and side effects such as redness, dryness, itchiness or even inflammation. If you are unsure what to apply, then DO NOT use anything. Applying topical product is strictly OPTIONAL! It is not a requirement. For all beginners, you should start out with 0.5mm and use it every 4 to 6 weeks until you know what you are doing before moving on to larger roller. If you are treating your body, then 1.5mm is fine, but I still think you should start out with 0.5mm. I personally use Vitamin C Serum from Skincueticals or Retin A from Ortho (Requires Perscription). I do not use other strange topical products. I am not sure about aloe vera. Neosporin is ok, but you really don’t need it unless you cut yourself which is very unlikely. I am not sure about gold bonds healing lotion. If the product is comedogenic (pore cloggin), then you should avoid it. Daily usage of topical product is your choice. It depends on your skin tolerance. Some people can get irritation or even pimples from excessive usage of topical products. I personally use vitamin c serum daily in the morning and Retin A at night before bed time with or without rolling. If you can not apply topical product immediately after a treatment, you should wait 24 hours before usage, BUT if the product has irritating acidic ingredients such as glycolic acid, salicylic acid, tca acid or chemical peel, then you need to wait 7 to 14 days for your skin to recover before usage. I used my 1.0 needle on my stench marks and it red left lines, almost like scratches, however they are not raised. Is this normal? My derma roller is new. Yes it is normal. Those are temporary needle marks. They will disappear within a week. You probably roll too aggressively or roll a little too much. All you need is a TOTAL of 2 to 3 rolls in horizontal, vertical or diagonal(optional) directions . For example, you roll back and forth once in horizontal direction (count as 1 roll) and then the vertical direction. I received the three rollers in boxes that indicate the size. What is the size of the one that comes attached to the roller? The one inside the long box with the handle is 0.75. If you are using 0.5mm, you should use it every 4 to 6 weeks. You can only use it once per week if your skin can tolerate weekly treatment without prolonged redness or irritation. Some medications can slow down the healing process. Since rolling also stimulates the healing process, your medications might slow down results. Hello , this is Sue for a second time . First Thank you for your response to my question about my intake of certain Medication that I take , and due to these Medications I’m taking where you said it would slow down the stimulating process from healing , and if that’s the only case are there any other side effect other than what was said about the stimulating process healing , and would it yet then be ok I could I still use Derma Roller , and if so would it take more slower the healing , is that also what you mean ?? Also, certain medications such as antibiotic can cause hyperpigmentation. Since rolling can stimulate mild inflammation, it can increase the hyperpigmentation process. If you are unsure, you should ask your doctor about your medications first. hello! i want to ask why i cant use dermaroller if i take antidepressants? Some medication can slow down the healing process, thus increases the recovery time. Also, some medication can cause hyper pigmentation such as antibiotic, and rolling can agitate your skin further. I am not sure about your antidepressant medications, but you should ask your doctor first. 1.5 IS NOT for weekly treatment. You can only use it every 6 to 8 weeks! First of all thanks for such a good information. I have a question. After derma rolling can i wash my face with warm water or directly apply vitamin C serum? I m using 1.0mm derma roller with 540 needles. I shall be very thankful to you. After rolling, you should clean off all the residues with a gentle facial cleanser or saline before applying serum. Hi, thank you for this blog. Please help me. I am desperate and have been going through skin issues for the past 4 months. I recently started getting really dark stretch marks all over my booty, and thighs. To a point where I cannot wear shorts anymore. I recently discovered derma rolling, from research. I also discovered Retina A. I recently ordered a 1.5mm roller (Which I will be using Twice a week, every 4 weeks), 0.1% RA (Not sure how often I should use this), Green peeling oil (which I will be doing 5 weeks after using Retina A), Vitamin C oil, Gold Bond Ultimate Healing Lotion, Amlactin, Emu oil, 4% Hydroquinone (From reading the blog, this should not be used, but should I use it since the stretch marks are new? ), Aloe vera gel, Dead sea salt soap, Kojic Acid soap, Raw shea butter. OMG! you are using too many products. I am getting confused. If you are using 1.5mm, you should only use it every 6 to 8 weeks. You can use hydroquinone or kojic acid product, BUT you can not use it “IMMEDIATELY” after a treatment. You can wait 24 hours before usage. Also, you shouldn’t expect immediate result. Stretch marks are extremely hard to treat. If you never used a roller before, you should use 0.5 every 4 to 6 weeks. Topical product is optional, but you can use retin-a after your treatment to boost collagen production. Important Note: Retin A can cause redness, irritation and peeling. Please use the lowest concentration and small amount of it. How many times can you use a roller before you have to throw it out? It is hard to say. It depends on how often you use it, where you use it, the size of your treatment area and how often you use it. If you are doing facial treatment once per month, it should last at least 6 months. If you are doing body treatment, it might not last as long due to thicker skin, larger treatment area and aggressive treatments. I used the .5mm on my face for ice pic scars on my face, would it be ok to use a 1.0 mm after 2 days ? You should wait 4 weeks before another treatment. This is a tough question. Hair loss is related to many things such as age, genetic, diet, infection or sickness. If you are completely bald, then rolling might not work. I am not sure about coconut oil, but most people use minoxidil to prevent further hair loss. No! 2.5mm (not 0.25mm) is not mainly designed for facial treatment. Avoid it at all cause unless you had it done in a professional clinic. Thanks for the informative post! I have some pores and not too deep but visible for me acne scars on the cheeks and the forehead. I am thinking of getting the 0.75mm size as a start? Would you say that size would be ok? If you never use a roller before, you really should start out with 0.25 or 0.5mm before jumping into 0.75 and higher. 0.5mm is actually a very good roller because it does not cause much redness or irritation so people don’t freak out. On the other hand, 0.75 and up can cause redness and irritation that can last 4 to 7 days. Many people think that larger roller can produce better result, but THAT IS COMPLETELY UNTRUE. This was soooo incredibly informative. Thank you so much for taking the time to write such a descriptive and easy to follow educational tutorial. I have been wanting to attempt this procedure but was at a complete loss regarding the process and equipment, but you have clarified everything. In the name of preparing for a personal milestone this summer, my interest in Collagen induction therapy via 1mm micro needles returned. This time around so much more information was available. After a lot of reading and watching videos I found this guide making the most sense. Of the six preferred active ingredients you list for ‘after,’ five were already included in my DIY formulations. Yay! Thank You for taking the time to share your experience! Hi, this is a very informative article. Learnt a lot about how to dermaroll my skin with scars. Can I know how long I should wait before applying serum after dermarolling? Can it be applied right after cleaning the blood and washing my face after dermarolling? I am just afraid the vitamin c serum might sting if I use it after dermarolling. Does it sting usually? You can apply topical product after the treatment, but you must make sure that your product does not contain irritating, toxic or comedogenic ingredients. If you are not sure, you should wait 24 hours before usage. Do you need to buy new heads for the microneedling or is it okay to use the same head multiple times as long as it is cleaned properly. You DO NOT NEED so many topical products. You only need 1. Using too many topical products can cause blackheads, whiteheads, irritation and breakout! I personally use Retin A 0.25 at night. I personally do not like vitamin C serum because It feels sticky on my skin. Thank you for your blog it realy helpful. Is it possible to apply apple sider vinegar to face after using derma roller to clean and to avoid inflamation.? And after applying this apple sider vinegar can I proceed to apply vit c serum? Thank you so much for sharing your beauty remedies. You should NEVER apply anything that is irritating. Vinegar is irritating to the skin. Also, you really should use 1 topical product. Using multiple product can irritates your skin. Hi…at what interval should I use .5 mm needle dermaroller for acne scar? All beginner should only use once every 4 to 6 weeks. Hi, I am possibly thinking about using a 0.5mm roller to treat acne scars. If I use it before I go to bed, is it fine to wear makeup the next day or will that get into the skin and break me Out? This is a good question. Most people treat their skin before bed and apply makeup the next day, but you should wait 24 hours because your skin will be slightly irritated. Hello there im gonna use a dermaroller maybe next week but is it okay ifim stilk using a peeling toner? What shoukd ido? No, you should not use any peeling or harsh product after the treatment. You should wait about 10 days before using any peeling product. I rolled once with 1mm and didn’t notice any redness or irritation. Should I do it more frequent? It was like I didn’t do anything. No, you should use once every 4 to 6 weeks. I think you can, but homemade natural products are not as concentrated as skincare product. Therefore you probably won’t get similar results. I used the 1.0 mm daily for 4 days unknowingly. Will it cause a major issue. My skin has got a bit of hyperpigmentation because of this I believe. It won’t cause serious issue because your skin will heal up, but it can cause prolonged redness, skin flaking or even irritation. You REALLY should use 1.0 once every 4 to 6 weeks. You can apply moisturizer or your favorite skin product, but you should make sure it does not contain irritating or peeling ingredients. I don’t bleed when I use the 0.5mm. My face only turns red from irritation. Am I doing it wrong? Bleeding is very minimal with 0.5. With 0.25, there is absolutely no bleeding. You do not need to bleed to see results. Mild redness and irritation is very normal. You will also experience mild skin flaking several days after the treatment while cleaning your skin. Hello, after Derma rolling my skin feels itchy and dry. I often give in to scratching it.is this harmful and also is it normal for the skin to be itchy?? It is quite normal for you to experience mild dryness, itchiness and mild flaking of your skin (several days after the treatment when you cleaning your skin) . You can apply moisturizer. It is best that your don’t scratch your skin, thus causing more irritation. First of all, thank you so much for this very informative article. I just started dermarolling and I used a ***mm on my stretch marks and loose skin on my belly three days ago (to try to tighten the loose skin after having 3 kids). I applied Matrixyl 3000, Argireline and Vitamin C serum, as well as Retinol 2.5% serum after treatment. I am also takig Collagen Peptides 1-2 scoops a day (11g – 22g). My tummy is now starting to itch a little but it is not as red as it did after treatment. Is the itching normal or is it part of the healing process? I don’t notice any peeling or dryness. Yes, some people do experience itchiness. You can apply moisturizer to minimize it. If you are treating your body, you probably won’t experience much skin flaking. sometimes, you can rub your treatment area lightly after a shower, and you will notice very mild skin flaking. I had a kidney transplant 8 years ago and I am on immunosuppressant. I am 48 and the signs of aging are slowly starting to appear on my face. I’ve been thinking about trying dermarolling for a few years because I have dark spots on my face, legs and bottom as well as surgery scars. Now that my face is showing signs of aging I am more determined to try it. Also if have any websites or links that can show me medical data on dermarolling and it’s reaction with some one taking immunosuppressants I would greatly appreciate it. Can i use organic raw honey after using derma roller? I never used raw honey before so I don’t really know, but you should stick with product that is strictly designed for topical application without irritating, pore clogging and harmful ingredients. I do believe honey is comedogenic, but I am not 100% sure. I am African-American and my skin tends to be dry, but my forehead is oily at times. I have old ( 2 years to be exact) scars and hyperpigmentation. Thus, I will be using a 1.0mm derma roller soon and am trying to figure out the best products or combination of products to use. When washing my face before rolling would Cetaphil or Hada Labo Tokyo Gentle Hydrating Cleanser be best? Would it be okay to use Hada Labo Hyaluronic Acid lotion and a vitamin C serum after derma rolling? Some people recommend using Cetaphil antibacterial cleanser. I am not sure about Hada Labo product because I never used it. My skin type is different than you. I have dried and oily skin. Therefore my skincare products will not work for you. In general vitamin c serum can treat sun damage or hyperpigmentation, but you should never use product that has irritating ingredients (Example: peeling agents, salicylic acid, glycolic acid, etc) immediately after a rolling session. I have Asian complexion in my late 40s. seriously upset for tanned skin and pigmentation specially in summers when there is temperature is above 45. A very comprehensive information, Thankyou so much. i was looking for this kind of detailed info. the purpose of using of Derma roller is my pigmentation on face. still have lot of fears for using. Have not bought yet. Im scared if i may get hurt or bring more scars. i need some opinion if some has tried for pigmentation. if you are really scared, then you should start out with 0.25 (NOT 2.5). 0.25 is strictly for boosting absorption of your topical product. This will improve result. For pigmentation problem, you can try vitamin c serum or retinol. Vitamin C serum is known for treating sun damage. Please note that retinol can cause sun sensitivity, irritation and skin flaking (Flaking is good because it can remove pigmented skin). Also, all topical product must not contain harmful, irritating or comedogenic ingredients if you are planning to apply it after a rolling session. After Roll Treatment (0.5mm) Face Wash Is Recommend Or Not ? After Face Wash Can Damage Skin Because of Product Absorption ? Or Before Treatment Rubbing Alcohol Recommend For Clean Skin Area ? or I used Rubbing Alcohol for clean Skin Area then I will start derma roller treatment quickly or wait for drying Alcohol or Wash alchol ? All your questions were answered in the article above. Basically, you only apply alcohol to your skin if you are using 0.5 and above. For 0.25, you do not need to apply alcohol to your skin. You should clean your treatment area again after a rolling session to remove all residues with a gentle anti-bacterial cleanser. Before a treatment, you should disinfect your roller with alcohol for about 20 to 30 minutes. Wait for the roller to dry before usage (no need to wash it again). You do not need to appply topical product immediately after a treatment. It is 100% optional. I’m looking at this again and can’t believe how wonderful a guide it is. I’m terrified to begin and if this wonderful site doesn’t get me started, nothing will. Thank you, thank you. after i did laser co2 fraxel . my doctor told me use Flamigel 3 or 5 times per day to heal my face. after 1 month now my skin not getting better i have acne scars on my face . my question is can i use dermaroller 1.5 or 2 and after deramrolling use Flamigel to heal the skin . and can i use size 2 dermaroller without using numbing cream . i can tolerate pain becos in my past i exploded alot of big acne and they bleed. Never use a roller after an invasive treatment such as laser, etc. Also, stay away from 1.5 and especially 2.0 if you never use a roller before. If you must use a roller, then start out with 0nly 0.25 (NOT 2.5). I don’t want to use alcohol to dis infect the roller,is there any substitute for alcohol which is both safe and effective.plz reply. You can also use hydrogen peroxide or dental tablet. Greetings, I have used the dermaroller 0.50, one day then again 2 weeks later. Today. I did not experience any irritation and only a little redness. didn’t see any peeling. I will have a laser hair removal visit on most of the face, areas treated with dermaroller. Not sure if I should delay this laser treatment. To when? And when to do the dermaroller after the laser treatment. These laser treatments are usually every 6 weeks as a maintenance treatment. You should wait at least 4 weeks before your laser treatment. Can I use mederma advanced scar gel after dermarolling? Or also apply mederma first and dermaroll on it? I’m planning to do it on my face with acne scars. You apply after the treatment, but I am not sure about mederma gel. In general, you should not use anything with irritating and pore clogging ingredients after a rolling session. Can we get rid of acne scars 100% after a log year of using derma roller? What percentage of improvement is possible? 100%? 100% improvement is very difficult if you have deep scarring. (c) Copyrighted 2014 Dermarollerinfo, All Rights Reserved. Dermarollerinfo.com Uses Affiliate links or Ads for Monetization.